I field a lot of questions from parents who are just starting out homeschooling their young ones, and most are terrified at the prospect of teaching their kids to read. There is good reason for this. While the act of reading seems quite simple to those of us who are already proficient, it actually involves a complex amalgamation of aural skills (hearing sounds accurately and clearly), symbolic skills (being able to recognize and translate symbols into something meaningful), visual skills (the ability to accurately track from left to right, and the ability to bring objects into focus), memory (the ability to retain and retrieve information), and comprehension and social skills (the ability to interact with the text, to empathize with characters and to interact with an audience). It is, therefore, not surprising that even basic reading is a skill which takes several years to develop, and more complex reading skills (think college level) can take a lifetime. Since this is such a complex enterprise, I thought it might be helpful to provide a list/review of some resources to help. Almost all children begin the process of reading by learning the alphabet. One major barrier to small children being able to use the computer is needing to develop the hand/eye coordination necessary to use a mouse. Although some programs have mouse skills games built in, the offerings are often insufficient. 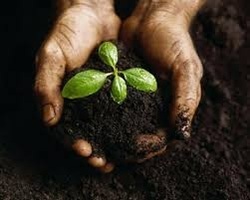 The following site provides children with an opportunity to gain these skills. www.poissonrouge.com/games.php – This rather odd gem is an extensive site with all kinds of games to click on and make something happen. Toddlers (and adults) can play for hours, fascinated by both the bright colors and the sense of whimsy. Another helpful tip is to switch out your adult sized mouse with a small laptop mouse. 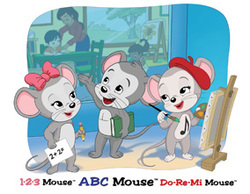 www.abcmouse.com – We have used this program for 2 years now, and of all of the resources that we have tried, I believe it to be amazing for introducing the symbols and sounds of the alphabet to very young children. Utilizing a game based design, the program is multi-modal, featuring, puzzles, books, art, songs, interactive games, virtual manipulatives and a reward system to enhance and direct your child's learning experience. In addition to instruction in reading, the child also receives opportunities for learning math, social studies, music and more. www.starfall.com – This phonics based program features an introductory alphabet level where children can interact the various letters of the alphabet to learn their symbols and sounds. Like an animated alphabet picture book, the program is simple, direct and engaging for the very young. www.abcya.com – This site offers resources for kindergarten through 5th grade. However, the kindergarten section features a number of interactive games to foster letter recognition. www.fisher-price.com/en_US/gamesandactivities/onlinegames/theabcszoolearninggame.html – If you have an extremely young child who longs to learn to read, Fisher Price offers this very simple game for infants and toddlers. 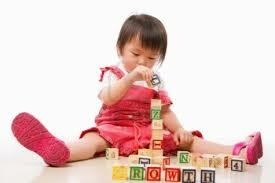 The child can listen to the Alphabet Song and press keys on the keyboard to see and hear letters. This is a good game for children who lack mouse skills or whose hands are too small to wield a mouse. www.turtlediary.com – This site features games for children from Toddler through 5th grade in a variety of subjects. It also features printable worksheets. While the alphabet is presented here in a less interactive format (kids watch videos of the letters after clicking to choose), it still provides good letter recognition practice. 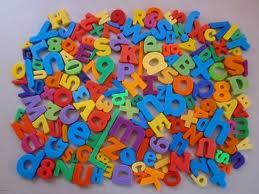 The internet abounds with ideas for crafts and games to help teach your child the alphabet. The main component that all of these activities share is creativity. Young children learn through physical exploration, so using crafts and exploring activities where kids can manipulate letters as they learn is a best practice. Texture Cards – Begin by making flash cards, but go that extra mile by piping glue over the lines and letting it dry to give it texture and dimension. You can also add sand, glitter, beads or anything else you can think of to increase the tactility of the letters. Children will enjoy tracing the letters while they learn their sounds. Letter Crafts – Both of my kids enjoyed letter crafts where we made letter templates on cardboard and then glued objects to the letter which began with whatever letter we were working on – beans for B, feathers for F and so on. Letter "I Spy" – We combined this game with our Letter of the Day. Each morning, my kids would open their toy mailboxes to find picture cards, magnets or small toys featuring our letter of the day. At some point in the day, we would go on a safari through the house to see if we could find objects beginning with the letter sound. Sand or Salt Trays – Pour salt or sand into a shallow baking pan or box and have your child try to draw a letter while saying the sound. Yarn/String Letters – Trace a letter with glue on a piece of paper and have your child use colorful bits of yarn or string to make the letter. Letter Fishing – It is easy to make a simple fishing rod with a dowel, magnet and string. Once the rod is made, you can attach paperclips to cardstock print outs and have your child fish for letters. This same game can be used for identifying colors, shapes, numbers or for sorting activities. Hopscotch – Make a hopscotch outline on the floor with masking tape. You can have you little one recite the alphabet while s/he jumps. You can place a letter in a square and have you child attempt to avoid that space. 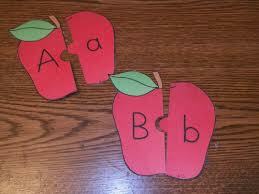 There is all kinds of potential for modifications and for teaching from one to multiple letters at a time. Rhymes and Songs – Both of my kids loved hand claps, rhymes and songs. We made up our own or searched online to find them. Letter Matching – Use clip art of animals, vegetables, dinosaurs or whatever your child is interested in which begin with each letter of the alphabet. Have your child match a letter card or magnet with the picture. For example, Z goes with zebra. Edible Education – Make snacks which begin with the particular letter in question or which look like the letter. Both of my kids had a plethora of alphabet toys. I will list some of the best ones below. Magnets – Invest in a nice set of letter and number magnets. Dollar store ones are nice in a pinch, but the magnets fall out and they are fairly small for little hands. They also get lost under the refrigerator much more easily than the larger variety. A good set of magnets can be used for years as your child moves from recognizing letters to practicing spelling and reading. Letter Puzzles – Whether you like cardboard, wood or foam, letter puzzles help your child not only to be able to recognize letters, but also to learn alphabetical order. don't forget that you can also make puzzles like the simple cardstock puzzle pictured below. Often alphabet sets either focus on upper or lower case letters, so children may have some difficulty relating the two. I mentioned that you can make puzzles to assist with this. Another option for teaching this skill is making or purchasing a memory game. You can make cards with images and have the kids match the letter to the image beginning with that letter, or you can make cards which match upper and lower case letters. If arts and crafts are not in your comfort zone, you can a simple set like this one produced by Learning Journey. Another winner is this Alpha Pops set by Learning Resources. 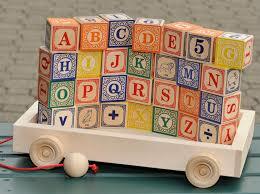 Alphabet Blocks – Kids love building with blocks and knocking them down. You can combine this activity with letter instruction simply by using letter blocks and having your children read the letters as they place them in their masterpieces. 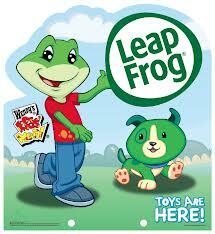 Over the years, we've used so many of the toys from the LeapFrog company that I think they deserve their own category. 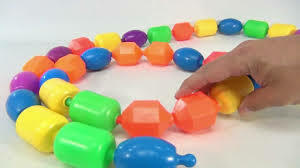 Durable, fun and educational, these toys were always a big hit with my kids. There are a number of letter recognition toys which grow with your child from basic alphabet recognition to three letter word recognition. 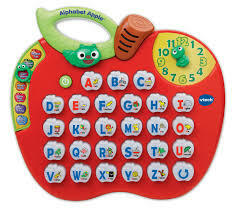 Although each toy may offer special features, they all feature large buttons on which the alphabet is emblazoned and a menu in which the child can hear letters, search for a specific letter, press any key to hear a letter, and in some of the more advanced toys, seek out letters to form words. 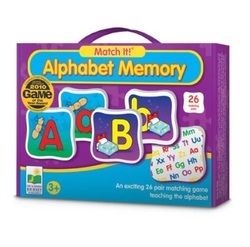 Letter Construction S﻿ets – A wonderful way to reinforce both pre-writing and letter recognition skills is to have children play with and build letters. You can certainly make tactile letters as mentioned earlier, or have your child practice erasing and writing chalk lines from a blackboard, or use something like Wikki Stix, chenille stems or clay to practice making shapes and letters. Another alternative, though, is to invest in a kit where the child is literally building letters from the curves and lines that s/he will eventually learn to write. 2 Examples are the Letter Resources and Handwriting Without Tears sets. Most children enjoy being creative with opportunities for open-ended play. 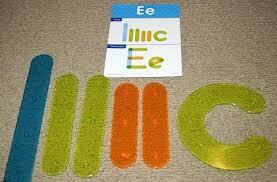 Why not, therefore, incorporate opportunities for your little one to be creative with letters. Stickers, stamps, beads, playdough, string, glue, alphabet sponges and paints, provide great opportunities for kids to make learning their letters into an artistic enterprise. These resources can be used through the toddler years and until the child is a proficient reader and speller. Of course, the best way to help your child develop literacy skills is to read as much as possible. There are more alphabets books on the market than anyone can count, but a few are real stand-outs.